No, another little one is not on the way. 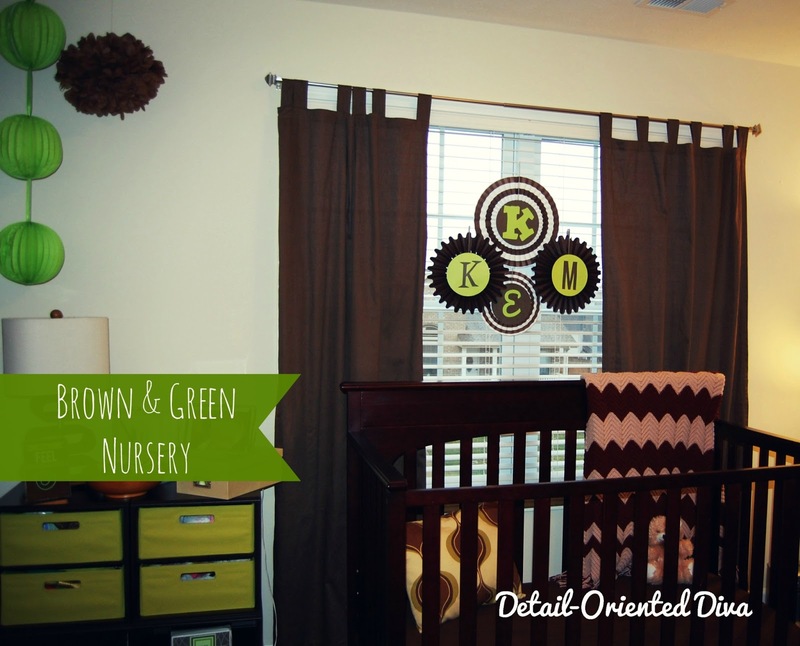 I just recently made the decision to convert The Kiddo's nursery into a playroom and turn my old office into her new nursery. You see, The Kiddo's toys had quickly taken over the entire bedroom and at night she seemed to be so focused on her toys that she would fight going to sleep. 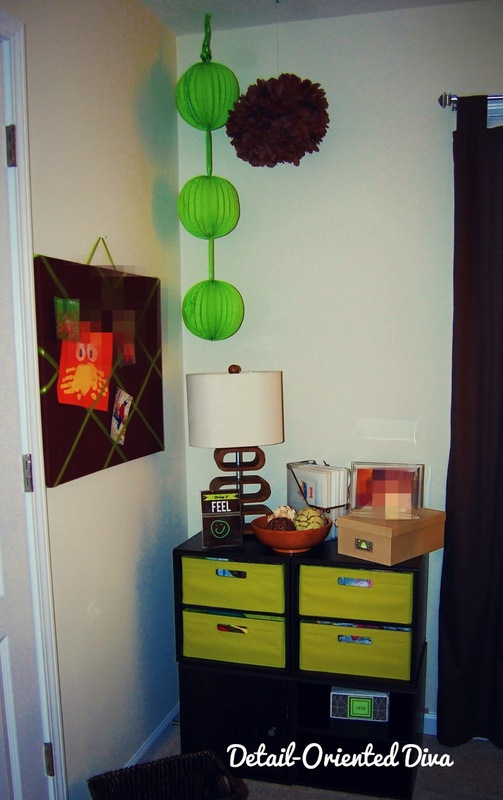 Since my office mostly functioned as storage, I felt it would just be best to turn it into another bedroom. With her soon converting to a toddler bed, I didn't want to be stressed wondering about what she might possibly get into at night. 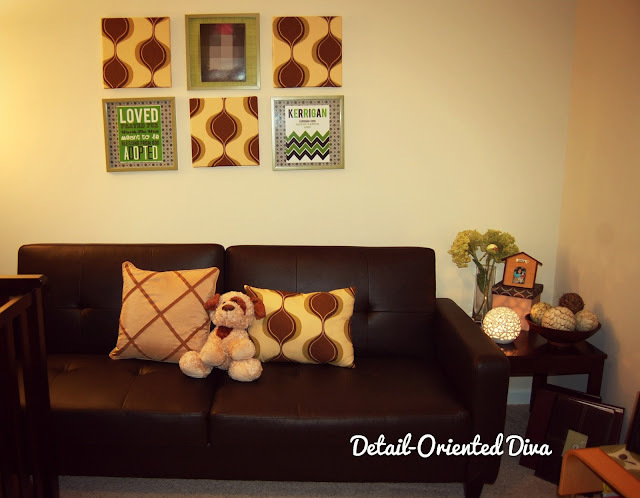 My office decor was very simple and worked perfectly for the conversion. For a look at the way my office looked before, see that post here. I decided to personalize some fans that I purchased from Oriental Trading for a baby shower that I am having for a friend next week. I got a ton for super cheap, so I thought it would be great to put the leftovers to use. I dressed them up with The Kiddo's initials (she has four) in different fonts that I cut out on my vinyl cutter. I kept some of my office storage system to use as a clothes dresser and then used the rest to organize the closet in the now playroom. That closet now stores everything that was in my office. It's crazy packed! But it works perfectly, since I normally just craft downstairs in the dining room anyways. The lanterns were already hanging, so I just let them be. I added a few more accent pieces that were originally in my office. These canvases and frames were already hanging in my office. I just changed out the pictures of my puppies with a picture of My Kiddo and the adoption art that I created. Of course, I changed the color scheme to match the room. The futon is great for bedtime stories and prayer time. I must also confess that it works great as a diaper changing and dressing table. I was super-thrilled with the way it turned out. 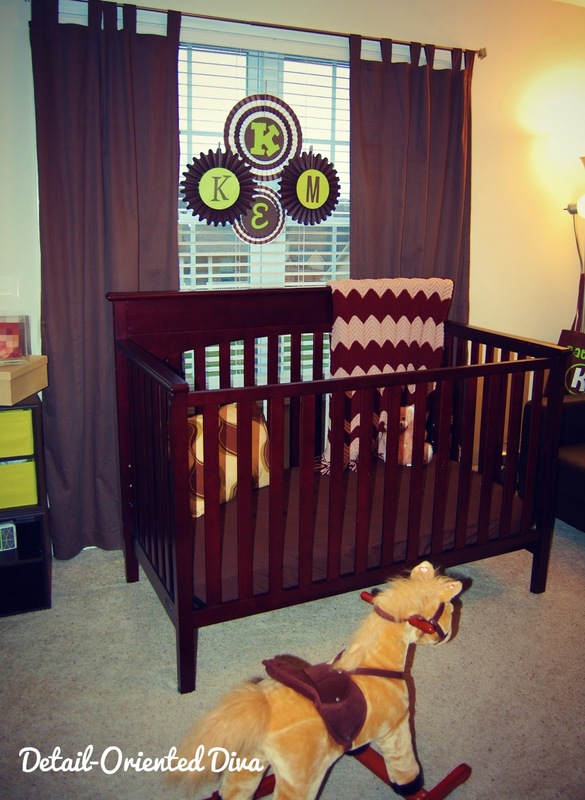 The only money spent on this redo was for the chevron blanket and brown crib sheet. Pretty awesome if you ask me! Oh my gosh, I LOVE it! The personalized fans are so cute!! You did an amazing job. Thanks so much Brittany! Just started following your blog. Your little one is super-cute! Looks wonderful--love the hanging initials!